There are several noxious weeds starting to make themselves known in the area after silently invading our gardens, parks and wild spaces. The Weston Village Residents’ Association is calling attention to a plant called ‘dog strangling vine‘. It’s a relative of milkweed but unlike milkweed, it has no natural enemies, spreads rapidly and will not support Monarch butterflies. Its long tendrils entwine and make it difficult to walk through them, hence the name. Dog strangling vine in flower. 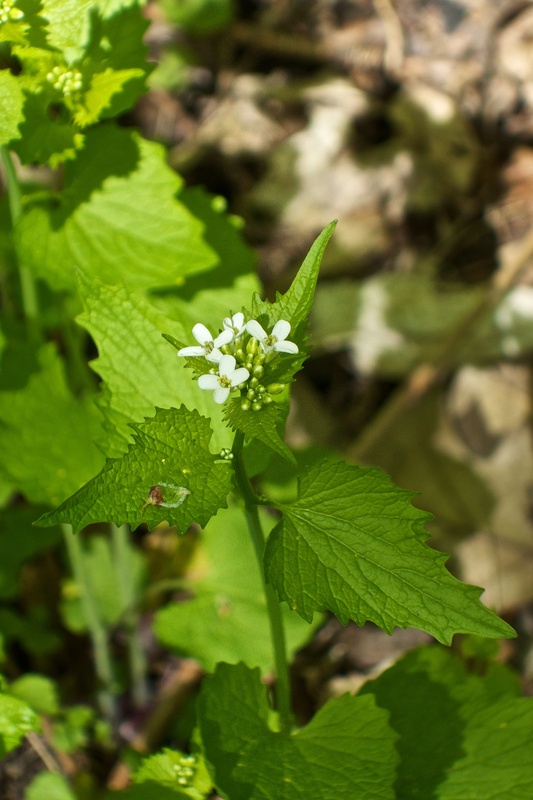 Another in the long list is garlic mustard which was imported in the 19th Century because of its usefulness in cooking (garlic and mustard flavour). Because there is nothing to keep it in check, it is crowding out many native woodland plants like trillium and trout lily. Garlic mustard in Raymore Park this spring. But wait; there’s a doozey waiting in the wings. Once sold as an ornamental, giant hogweed is a relative and look-alike of cow parsnip. Giant hogweed was imported as a spectacular garden plant as it can grow to over 6m (18+ feet) tall. Bee-keepers liked its huge numbers of flowers (and therefore seeds). If its size and ability to spread rapidly isn’t bad enough, GH is a phototoxic plant. When GH sap is allowed to contact skin, exposing the skin to sunlight can lead to blistering and scarring that can last for years. Sap in the eyes can lead to temporary or even permanent blindness. GH has been seen in the Toronto area but it probably hasn’t arrived in Weston yet. There is a hotline for sightings of this plant. 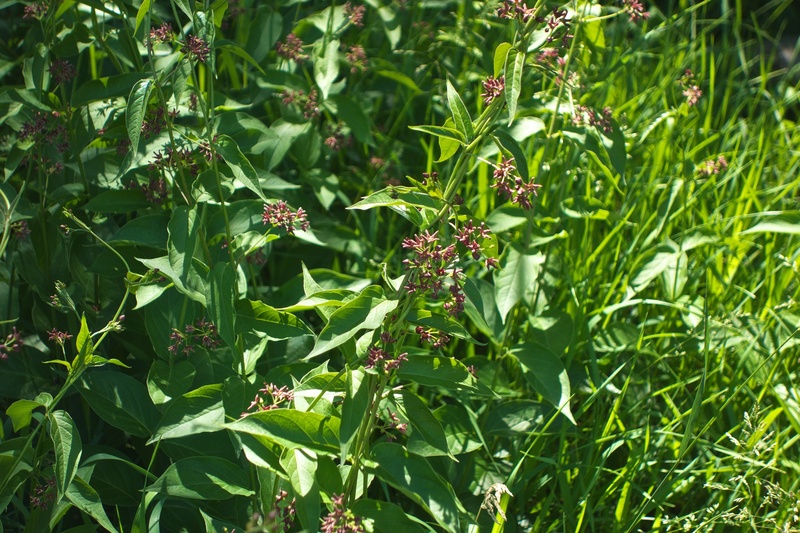 Unfortunately, any place on the North American continent is susceptible to invasions that arrive and there is little that the average citizen (no, not even Westonians) can do to get rid of these weeds other than keeping them out of our own yards. Some groups spend countless hours weeding garlic mustard and dog strangling vine from parks but this is a drop in the ocean. Sadly, like most plant and animal invaders (sparrows are not native), many of these weeds will be with us forever. The answer is biological control. This can be achieved through the weeds’ natural enemies that were left behind in their homelands. Scientists are busy looking for bugs that will feed exclusively on these weeds. This was how Purple Loosestrife was tamed. A couple of decades ago, loosestrife was crowding out wetlands but then after rigorous testing, a bug was imported and purple loosestrife is just seen occasionally. As for giant hogweed, authorities fear that it is here to stay. SO much interesting information — thank you! It’s good to know that Purple Loosestrife, which I only knew enough to glare at when I saw it, has been tamed, and so cleverly, and to know what to glare and and rip out of our gardens now. Thanks, Roy, and the photos are an excellent help. Previous Previous post: Humber? I hardly knew her!